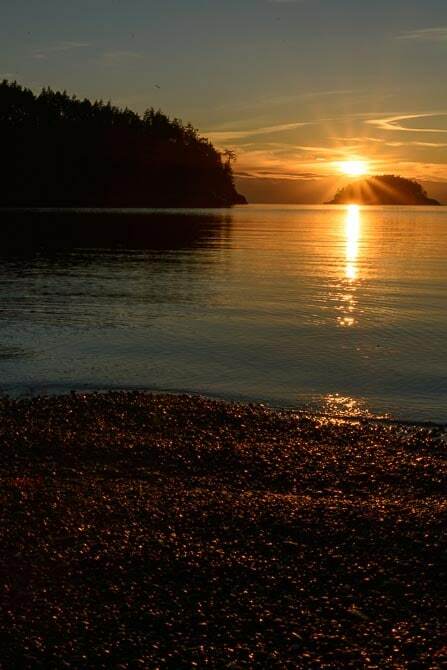 Exploring Whidbey and Camano in the off-season sometimes means getting your travel in before winter’s early sunsets. Exploring in January is going outdoors when nature is not warm and fuzzy, but is very much natural and ready to show her spectacular self to anyone willing to risk the weather just a bit. It was clear but the winter light was fading as I drove into Bowman Bay. As a photographer, I was worried about that perfect “golden hour” just before sunset light. “What was I missing,” I worried as I drove into the parking lot. Take SR 20 north from Oak Harbor and cross over Deception Pass. Drive another .7 miles and turn left on Rosario Rd. Almost immediately (about 200 feet), turn left again at Bowman Bay Rd. Follow Bowman Bay Rd. down to beach parking. 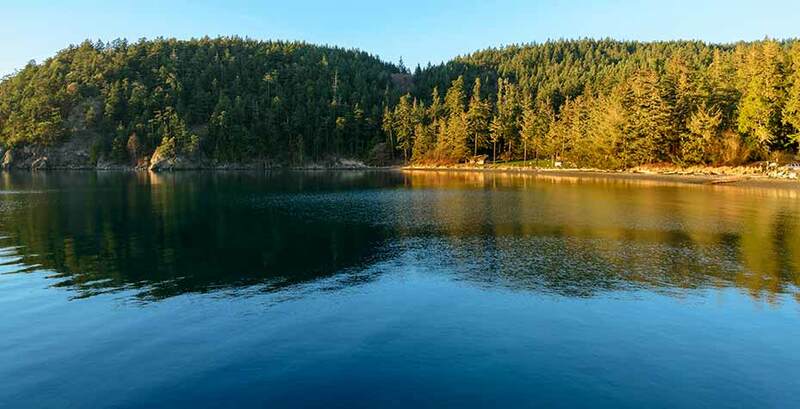 Bowman Bay is a perfect family outing, complete with grassy space and a playground along with barbecues and picnic tables to complement a spectacular water view. But, this time of year I was worried the view would fade to black. I took a deep breath and relaxed. It was all there, and would remain bathed in winter’s golden hour for a while longer. 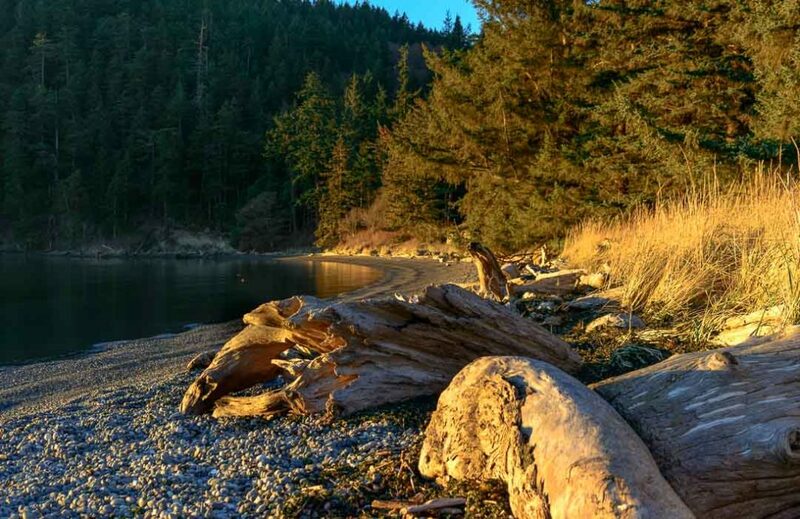 Although actually a part of adjacent Fidalgo Island and not on Whidbey Island, this beach is part of Whidbey’s signature state park, Deception Pass State Park. Like every tourist does no matter what time of the year, I wandered out onto the pier. At other times of the year, people would be fishing and crabbing from the pier. Today, I was by myself, except for a crow that was using crow-speak to encourage me to go elsewhere. Eventually heeding his advice, I wandered back to the pebbled beach near the parking lot. A couple of hikers who arrived about the same time I did were already out of sight on a park trail. The bay wasn’t always so quiet. There was once a large Samish village here. The military used it for a while and a state salmon hatchery operated here until 1970. Some of our island beaches are rocky, others sandy and most all strewn with driftwood. Here, however, it was pebbled with millions of small water-sanded golf-ball sized stones. The sun was lower in the sky, partly hidden by clouds that seemed to signal a change in the weather. The light was fading and the day was nearly done. As I packed my gear I saw another photographer toting a tripod out to the beach. Yet another photographer showed as I started the car. “What was I missing?” I worried as I drove out of the parking lot.